Disneyland may be the Happiest Place on Earth, but don't think that means you can just waltz in and do whatever you want. In fact, Mickey Mouse's theme parks have banned quite a few things over the years. Here are just a few of the things on which the Mouse has dropped his hammer. Until the late 1960s, men could either have flowing locks or enjoy Adventureland, but they definitely couldn't do both. According to Snopes, if a long-haired fellow tried to buy a ticket, a cast member would discreetly and politely inform the man that his hairdo didn't jive with the park's unwritten dress code before escorting him from the park. In 2000, Disney was having trouble drumming up enough manpower to staff its parks, so it relaxed the facial hair ban. Employees were finally allowed to grow mustaches, provided they kept them trimmed and groomed. Beards didn't fare so well, though; they stayed on the forbidden list. How could anyone not like the cute-as-a-button star of Gossip Girl? Disneyland apparently wasn't always amused with Lively's pre-fame antics. According to Lively, when she was six, she and her older brother used the old put-hairspray-on-a-friend's-readmission-hand-stamp-to-transfer-the-stamp-to-their-own-skin trick. It would have been the perfect crime, except security nabbed the Lively kids right as they went through the park's turnstiles and slapped the pair with a one-year ban. In June 2007, four Florida State football recruits met up for a little bit of fun. 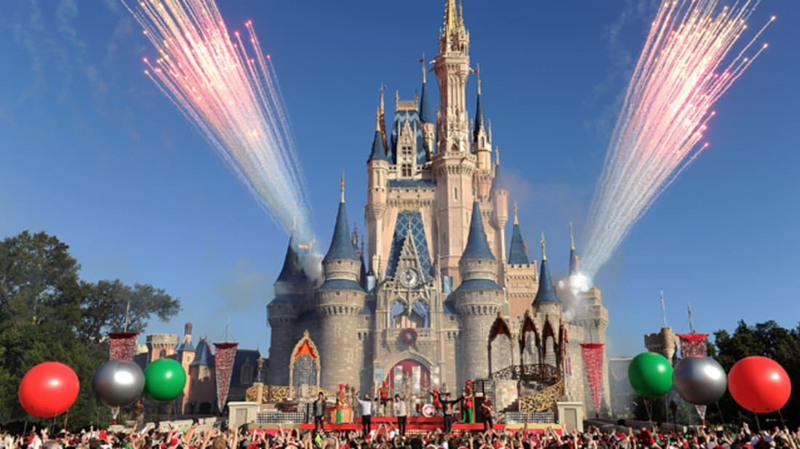 Instead of engaging in any of the myriad nefarious acts a group of 18-year-old males are known to favor, the players decided to go to Disney World, which seemed like the very last place in the world they could get into any trouble. Wrong. Park officials approached the men, all of whom were African-American, while they hung out in Downtown Disney and ejected them from the park for violating its anti-loitering rules. Security also hit the players with a lifetime ban from the park in a move that many Disney critics claimed smacked of racial profiling. You may want to dress up like Jack Sparrow for a day of riding Pirates of the Caribbean, but if you're older than nine, forget it. Disney bans any costumes and masks on anyone who's ten or older. Also listed on Disney's park dress code: "Makeup that could be construed as part of a costume. " So go easy on the eye shadow—the fashion police might decide you're shooting for a 19th-century harlot look and give you the heave-ho. In early 2008, upstart English punk band Gallows was all set to open for Social Distortion at a gig at the House of Blues at Disneyland. The bill seemed like a good way to get exposure for a band that was starting to catch on stateside—or it did until Disney officials actually stopped to listen to Gallows' debut record, Orchestra of Wolves. Once Disney brass heard Gallows' tunes, they nixed the show due to the band's occasionally offensive lyrical content. While it seems odd to get upset at a punk band for being abrasive, Disney's move wasn't unprecedented. Just a few months earlier, the company had banned the metal band Machine Head from performing at the House of Blues for similar reasons. Kids banned by Disney? You bet. In January 2008, Disney announced that children under the age of 10 would no longer be allowed to dine at Victoria & Albert's, the ritziest restaurant at Disney World's Grand Floridian Spa and Resort. The move made news, but Disney officials claimed that the AAA five-diamond-rated restaurant didn't attract that many children in the first place. In addition to being pricey, Victoria & Albert's only offered a fixed-price menu with kid-unfriendly offerings like caviar, so the restaurant only catered to a handful of young diners each year. GOB Bluth is going to be in quite a bind if he ever tries to ride his Segway into Disneyland. The company bans Segways from its parks, ostensibly because it's tough to balance safety issues with the potential for having a fleet of two-wheeled vehicles rolling around the grounds. The trouble here, though, is that a lot of disabled people use Segways in lieu of wheelchairs. These folks were understandably peeved that they couldn't visit the parks using their preferred mode of transportation, and several of them filed lawsuits. So far it's been tough for the Segway riders to get Disney to budge; earlier this fall, a federal judge threw out a class action lawsuit brought against Disney by Segway devotees. The ruling left an opening for further legal action, though, so this court battle may not be over yet. Disneyland as a battleground for the Cold War? Believe it or not, that's exactly what it became in 1959. That year, Soviet leader Nikita Khrushchev spent 11 days visiting the United States. He spent one day of the trip in Los Angeles, and the fierce orator wanted to see Disneyland. However, the LAPD and the rest of Khrushchev's security detail were worried about his safety during such a trip, so they nixed the idea. Khrushchev accepted the news with characteristic poise, which is to say he exploded. He ranted, "And I say, I would very much like to go and see Disneyland. But then, we cannot guarantee your security, they say. Then what must I do? Commit suicide? What is it? Is there an epidemic of cholera there or something? Or have gangsters taken hold of the place that can destroy me?" Want to chomp on some gum while you're standing in line at a Disney park? You'll have to bring it with you from home. In an effort to keep chewed gum from being stuck all over the parks, none of the shops in any Disney theme park sells gum. Supposedly this innovation came from Walt Disney himself, who wanted to make sure that his guests could enjoy their visits without getting gum stuck to their shoes.